Whenever I see the Queen of Pentacles show up in a reading spread, whomever it may represent in the reading, you are looking at someone where status is important (you love those designer clothes!) but yet down to earth in seeing other peoples needs and wants to help in some way. She is the original Earth Mother, showing her love and appreciation by keeping a warm and inviting home and always willing to help bring in a decent income to support herself or her family financially. The Queen of Pentacles represents prosperity and security. 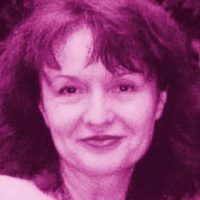 She suggests that you have worked hard to generate a level of financial or physical security which, in turn, gives you the ability to be generous with others and to share your wealth and prosperity with those you love. The Queen of Pentacles is one of those “I can do it all” women who can work a full-time job, take care of her children, keep the house livable and usually will have her own bank account or portfolio that she keeps stashed away on the side. It is important to you that you are able to live independently, with a stable income and with enough time and space to also nurture your family and loved ones. She can represent a mother figure in your life who provides you with loving support and nurturing to help you get through the influences of your past or may also be you as a teacher, a counsellor or mentor to all those who you are close to. The Queen of Pentacles reversed, sometimes shows a deep loneliness and feeling of isolation. She usually has an attachment to animals and nature but when it comes to people, she may feel disconnected and aloof, not having the ability to connect at the heart level. Being in the Pentacles realm, she usually chooses gifts as a way of making heart connections but never really connecting emotionally. 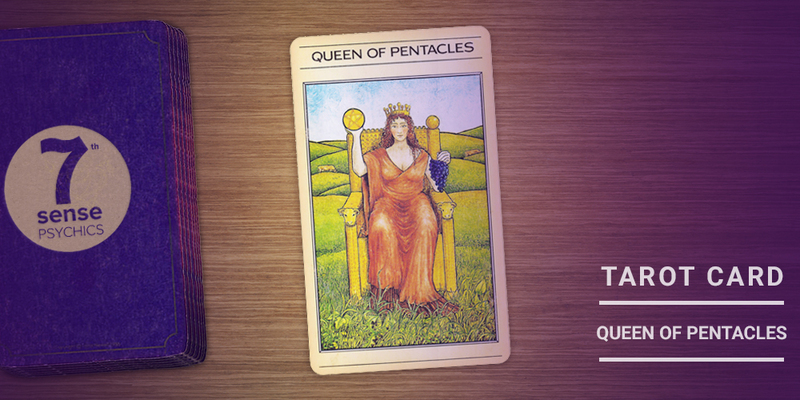 In general, the Queen of Pentacles, like all the court cards, she often stands in for an actual female in your life. The energy of the Queen of Pentacles is normally a feminine archetype; hearth, home, motherhood and likes the good life and also willing to work hard to make that happen for herself and her family. When Career advancement is being looked at, it shows you are on your way to making great strides forward in your career and finances. A woman, usually with dark hair and/or eyes may play a significant role in your working life; if so, know that she is an ally for you. In Love and romance, this is a very feminine card and also points to the possibility of someone new coming into your life if you are not currently involved with anyone. She is showing that love will find you and it is not necessary for you to chase it, just make yourself very available. When the timing is right, it will be made abundantly clear that you have someone special in your life. Staying upbeat and knowing without a doubt, that you bring many consequential qualities to the table in a relationship. Where Money is being looked at, the Queen of Pentacles is an excellent sign that your prosperity is likely to start increasing. Saving is important of course, but when that upswing in abundance shows up, enjoying your life when you have the means to do so is also important. Share what you have when you can. Health when the Queen of Pentacles shows up is a heads up that you may need to create time to focus on improving your health. If you are constantly overdoing by putting everyone’s needs before yours, then your health may suffer as a result. Balancing a good daily health regime is important to live a full and happy life. Remember the old saying, “if you do not have your health, then you are incapable of enjoying any rewards you may have earned”. In the realm of Spirituality, you are being told to trust your own beliefs and instincts. You may not see things spiritually the way everyone else does, but if your belief system works for you, that’s what’s most important. When it comes to our spiritual lives, other people’s input is sometimes important to listen to but ultimately, we must make our own spiritual decisions. If others don’t understand your choices, be ok with that. Whether we are representing the Queen of Pentacles or there is a woman of that nature who has influence in your life, it is good strong nurturing energy. What is important, is to make sure that you include yourself in that mothering, prosperous, kind and compassionate giving nature. Previous ArticleYou Don’t Have To Be Perfect To Deserve LoveNext ArticleHappily Ever After With Not-Your-Soulmate? Thank you for this message I appreciate it! Thank you for sharing this, it’s just what I needed to hear. Thank you for your uplifting comments on the Queen of Pentacles tarot information. That is what we hope for when we break down the definitions of each tarot card, a better understanding of tarot for our clients and how it works in your life. As always, for a more personal perspective, contact any of our great 7th Sense Psychics who can help more definitively. Thank you! I enjoyed what you wrote and it fit me quite well. It hit the nail right on the head with that one!! Thank you.